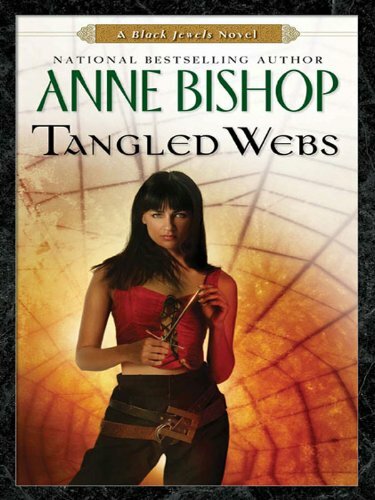 Description: New York Times bestselling author Anne Bishop returns to the “bewitching” world of the Black Jewels with a tale that will “leave readers’ hearts pounding” (Publishers Weekly). Surreal SaDiablo, the former courtesan and assassin, is the first to arrive—only to find herself trapped in a nightmare created by the tangled webs of Black Widow witches. And if she uses Craft to defend herself, she risks being sealed in the house forever. My Thoughts: A new author has taken the Blood by storm. Jarvis Jenkell is a famous author among the landen. He has just learned that he is Blood and has decided to write a semi-autobiographical mystery series. Unfortunately, he doesn't know anything about actually being a member of the Blood and his attempts are laughable - to the Blood. Jenkell's book gives Jaenelle an idea. She and Marian are going to create a "spooky house" that plays up to the landen's stereotypes of the Blood. Neither Daemon or Lucivar are really excited about this idea but they have a hard time saying no to Jaenelle. Jenkell also has plans for a "spooky house." He wants to get back at the Blood who laughed at him. He is particularly angry at the SaDiablo family. He sends invitations to Lucivar, Daemon, and Surreal. Lucivar and Daemon don't respond for one reason or another but Surreal does and takes along her friend Warlord Prince Rainier. Soon Surreal and Rainier find themselves trapped in Jenkell's house along with seven young adults. Everywhere they turn they find traps and dangers that they need to survive. They also need to find a way out without using Craft because each use of Craft closes one of the exits. Closing them all will leave them trapped forever. Once Jaenelle, Daemon and Lucivar discover Jenkell's house, they have to find a way to outwit him and get their friends out. Jenkell will soon find out what it means to anger a Black-Jeweled Warrior Prince and Eyrien Warlord. And Jaenelle isn't pleased either! I enjoyed this story despite a lot of spooky parts. Giggling spiders! Beetles! I loved seeing Daemon and Jaenelle's relationship now that they aren't in the middle of saving the world. Lucivar shrugged again. "Most people think in straight lines; Tersa thinks in squiggles. Just means it takes a little longer to get an answer when you ask her a question."